Well, that was a disaster of a road trip. The Bulls lost five and won just one game. And the Bulls come back to play seven games against the very same teams (double header tonight!). Here's hoping they can do better at home. 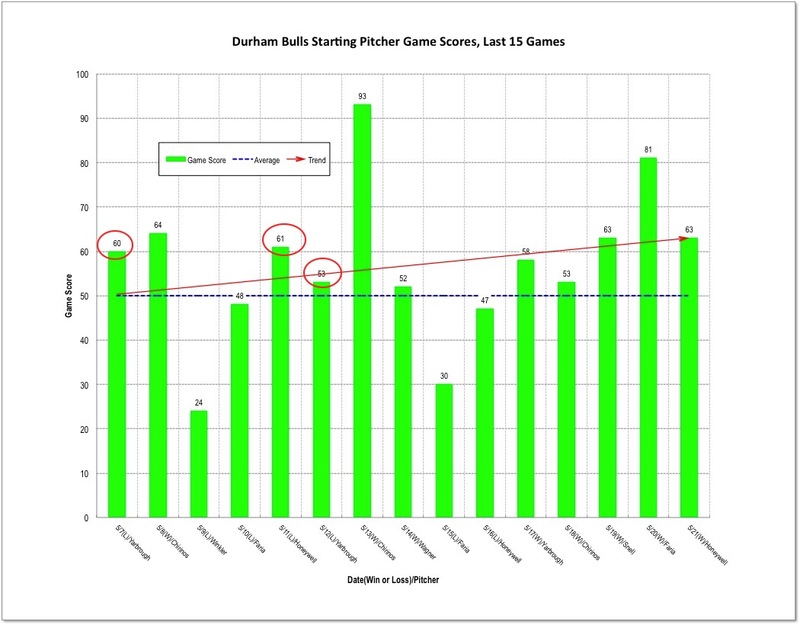 Starting pitching has not been the Bulls strong point this season, but they're still a pretty good crew. 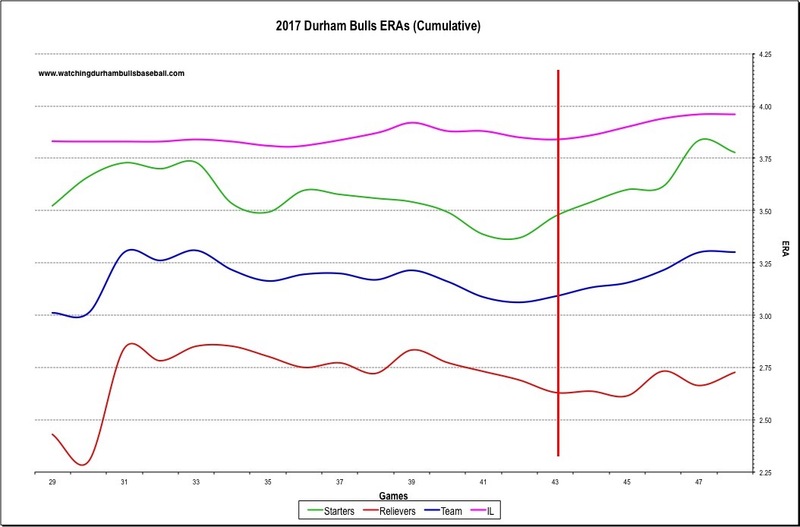 Also, they've stayed below the league average in ERA. Nevertheless, over the six-game trip, their combined ERA went from 3.47 to 3.78 and they took the blame for two of the five losses. The relief crew, a great bunch by any measure, went from 2.63 to 2.73 and took the blame for three of the losses. Particularly noticeable was the starting pitchers giving up 6 home runs (the relievers gave up 2) and the poor road performance of Blake Snell and Brent Honeywell. 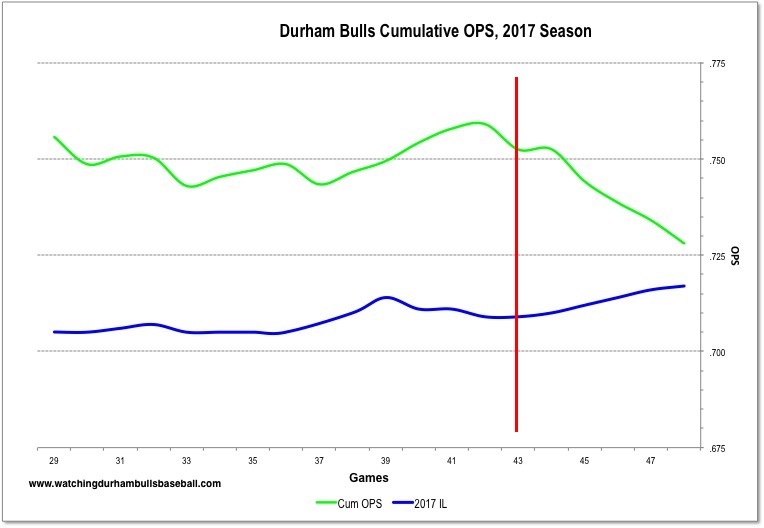 Overall, Rochester and Pawtucket scored 30 runs (all earned, so you can't blame the defense) and the Bulls scored just 14. The team ERA went from 3.09 to 3.30. The hitters did particularly poorly over the duration of the trip. 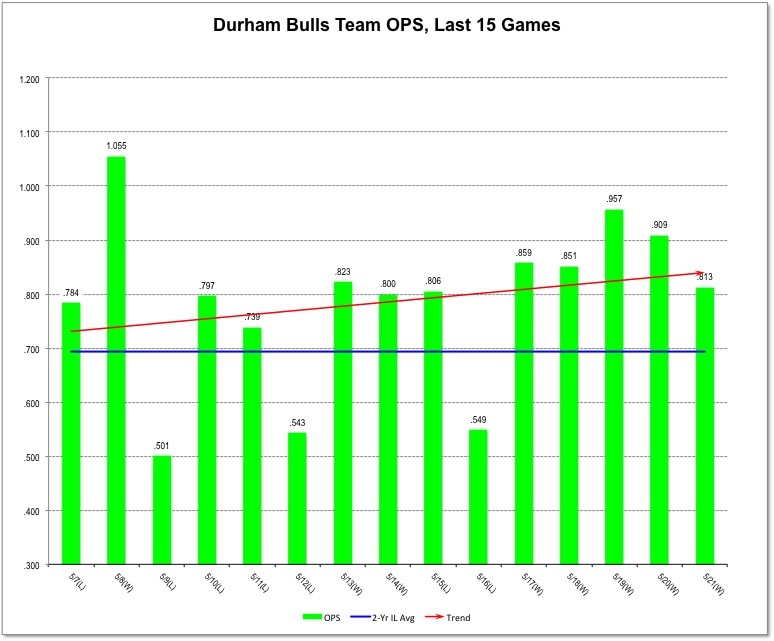 The team OPS (On Base Percentage plus Slugging) dropped from .759 to .728. 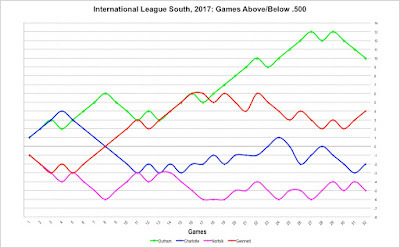 Meanwhile, the Gwinnett Braves were at home winning 6 of 7 games and climbing back to within 2½ games of the Bulls. Seems like the entire Northeast got rained out yesterday, so the Bulls moved on to Pawtucket, Rhode Island for four games against the Boston Red Sox AAA team. The Bulls split their two games with the Rochester Red Wings, with a very dramatic comeback win in the second game. 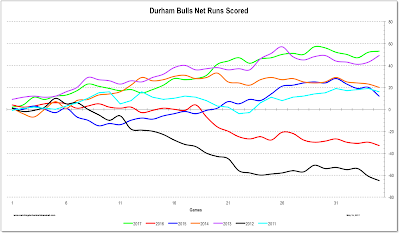 The rained out game, by the way, will be played as part of a double-header the day the Bulls come back to Durham. Most years Bulls/PawSox games are terrific contests, especially when the Red Sox Nation turns out in force at the DPAC. This year the PawSox aren't doing so well. We'll have to see. 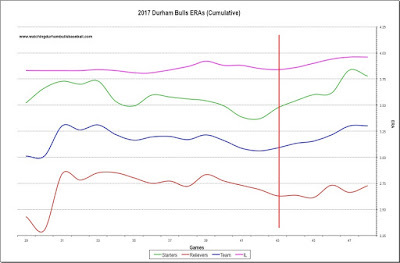 The Bulls lead them in every category except fielding. Thanks to Hank chasing down Taylor Guerrieri's status. Doesn't sound good. 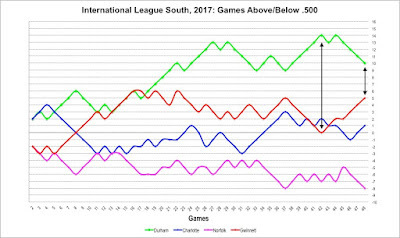 Well, you can't ask for a better home stand than a 4-0 sweep of the Bulls' main competitor in the South Division (although I sure am tired of watching them play Gwinnett and they are probably tired of playing Gwinnett). The Bulls outscored the Braves 25 runs to 9. 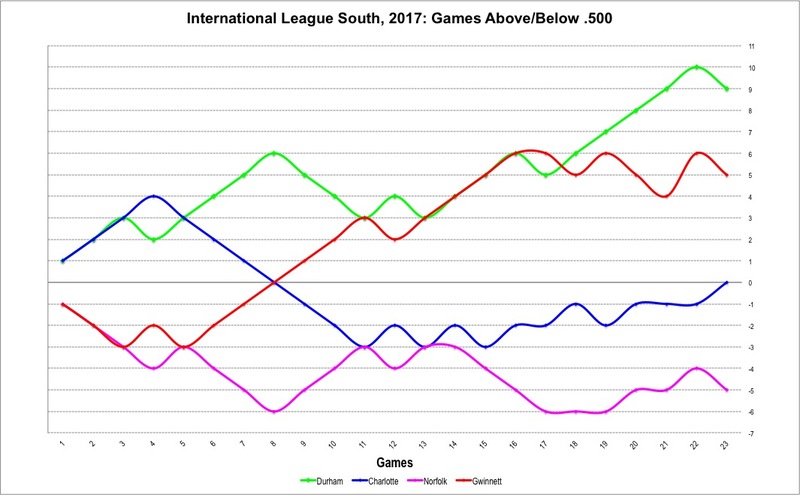 They left town 14 games above .500 and 6 games ahead of Charlotte, who has moved into second place. Game Score is one of those relatively new stats that is showing up on the box scores. The idea was to come up with a number that shows how well the starting pitcher did that made more sense than the "quality start" idea. What this chart shows is the starting pitcher game scores of the last 15 games. 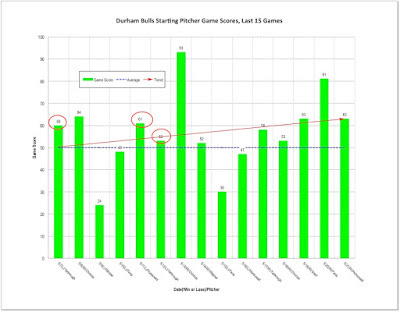 Circled are a couple of instances where the starting pitcher did a decent job and the Bulls still lost the game. But the Bulls crew can be very proud that everyone in the last round through the rotation was well above the 50 mark (and the Bulls won all five games). 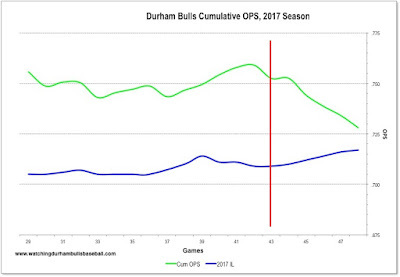 Similarly, Bulls hitting has been terrific from game to game. That makes for an overwhelming combination. The Bulls play in Rochester, New York tonight. 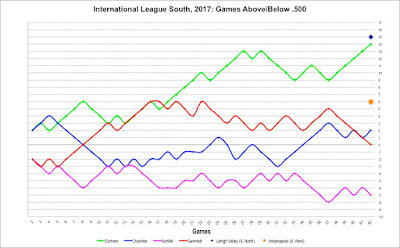 The Red Wings are the Triple-A affiliate of the Minnesota Twins and have been having a decent year. The Bulls have a substantial lead in every category. The Red Wings are coming off of two losses at Scranton/Wilkes-Barre. Tonight's game will be the debut of RHP José De León, a member of the Rays' 40-man roster who has been rehabbing from a spring training injury for this year. How is he going to fit in? Your guess is as good as mine. 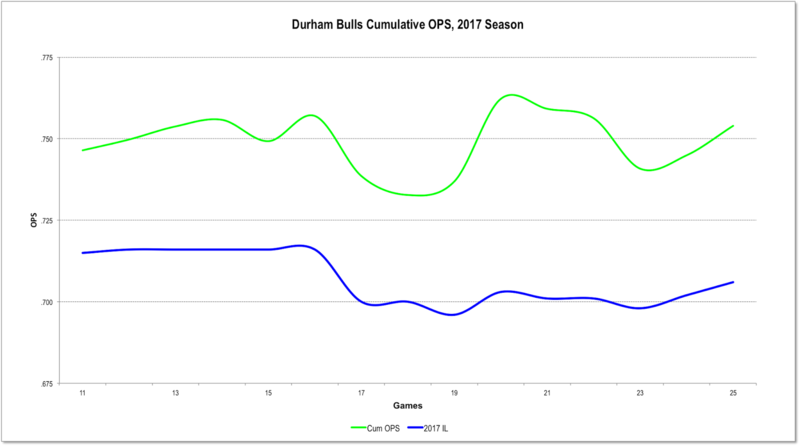 Seems like feast or famine in the Bulls starting pitcher world this year. Kyle Winkler was put on the inactive roster to make room. Bulls fans can be very proud of the leadership that is being shown by Capital Broadcasting as they sponsor building a Miracle League field over on the other side of the freeway. The Miracle League is an amazing organization that provides a venue for everyone to play baseball and could not be more fun to watch (and participate in). Well, this wasn't all that great a home stand for the Bulls, but it did end well. The four-game losing streak was disturbing; however, things seemed to sort themselves out the last two games, even if yesterday was touch and go. Sunday was the 4th "bullpen day" since April 27. The Bulls have won three of those games, which says a lot about this year's relief crew. Without Yonny Chirinos' complete game shutout on Saturday, I doubt that it would have worked yesterday, though. Statistical trivia. Don't think I've seen two blown saves in one game before. Sunday was also the seventh extra-inning game the Bulls have played. They won 3 of those games. 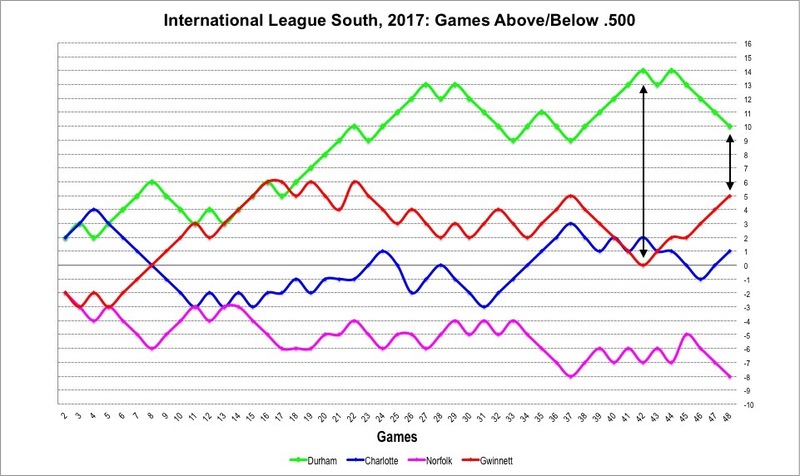 The Bulls are four games ahead of Gwinnett in the South, but note that Charlotte's on a streak. Net runs scored is one of those interesting stats that we like to track. If you run it through the Pythagorean Expectation formula, it will tell you what the team's won-lost record "should" be. In the Bulls case, this year the PE formula says that the Bulls "should" be at 23-12, exactly where they are. The Knights, who are at 18-17, "should" be at 19-16. The sabermetrics guys seem to think that discrepancies tend to indicate strengths (weaknesses) in relief pitching. 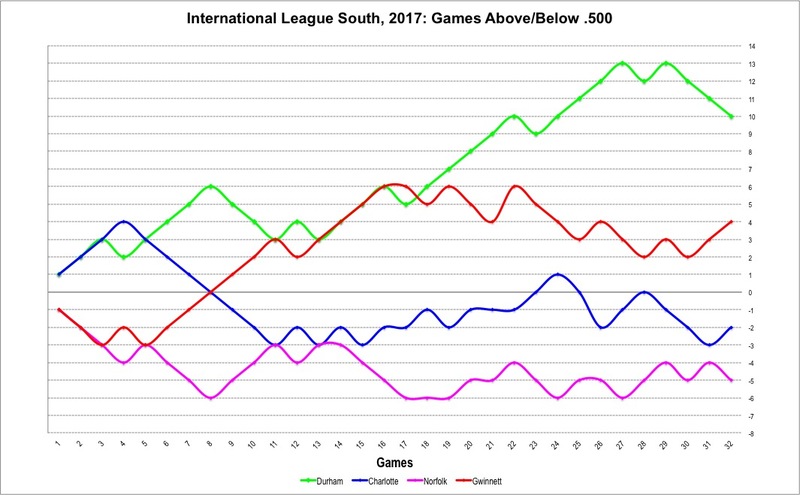 What this chart shows is just how well this year's team is doing compared to previous years, the best since 2013. RHP Yoel Espinal came back from Montgomery and did a fine job last night. RHP Ryan Stanek got called up to Tampa Bay and had his big league debut against the Red Sox last night. He faced two batters. One hit. One K.
RHP Blake Snell is coming back. 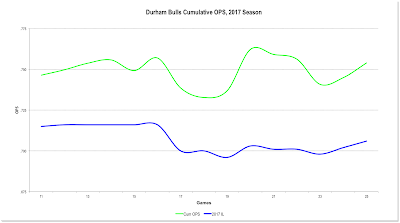 In my end of year comments last year I said that after Snell's callup in June he would not be back. I was wrong (imagine that!). He hasn't been having a very good year with the Rays (4-0, 8 games, 4.71 ERA, 25 BB in 42 innings). Expect him to be working on very specific tasks, which may or may not help the Bulls when he shows up. Charlotte's on a roll lately. And they are hitting very well. And they are at home. This could be an interesting series. Missing from the accounts of the last four games is the fact that a former Bull played a key role in two of the Bulls' losses. Richie Shaffer, who spent part of 2015 and most of 2016 with the Bulls, is now in the Cleveland system. He got key hits in games 2 and 3 of this series. 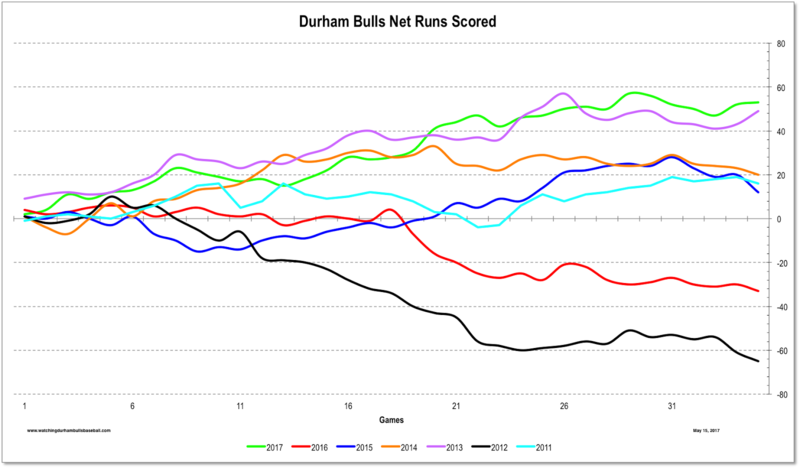 Nevertheless, even after losing three games in a row, the Bulls remain firmly in first place. LHP Justin Marks went up to the Rays. Got DFA'd and then claimed by the LA Dodgers. I'm just a blogger, but sure looks like a dumb move by the Rays. RHP Chih We Hu is back, but not as a starting pitcher. So that hole remains unfilled. RHP Kyle Winkler is back from "extended spring training"
Outfielder Shane Peterson, who started the year with the Bulls, is back from TB. Outfielder Granden Goetzman, surely one of the more exciting Durham Bulls in a while, has gone back to Montgomery. Outfielder Dayron Varona has been "assigned" to the Hudson Valley Renegades. RHP Diego Mareno got called up. In most years visits by the second-most famous team in minor league baseball, the Toledo Mud Hens, are fun. Probably will be fun this year as well. The Mud Hens are leading the West Division, but their numbers are not good. On paper, the Bulls should be in good shape. On the other hand ... Tampa Bay, where's a starting pitcher? The Bulls have been without a 5th starter for a long time and it's starting to show. They used three (3!) position players as pitchers the other night. They gave up 10 runs on 7 hits and 6 walks in 2 innings, putting a severe kink in the team's pitching stats. The Durham Bulls won two games in Gwinnett to near-empty stadiums, but things were looking up this morning for an education day. Then the clouds opened up and the game was postponed. The Bulls headed off to Norfolk. They Bulls are doing very well. Ryne Stanek's performance in game two last night was particularly impressive. After the Bulls had come from behind to get ahead by one run, Stanek came on for the 9th. The first two batters got hits and ended up on 2nd and 3rd with no outs. Stanek struck out the next three batters. That could have been a turning point for this young man. 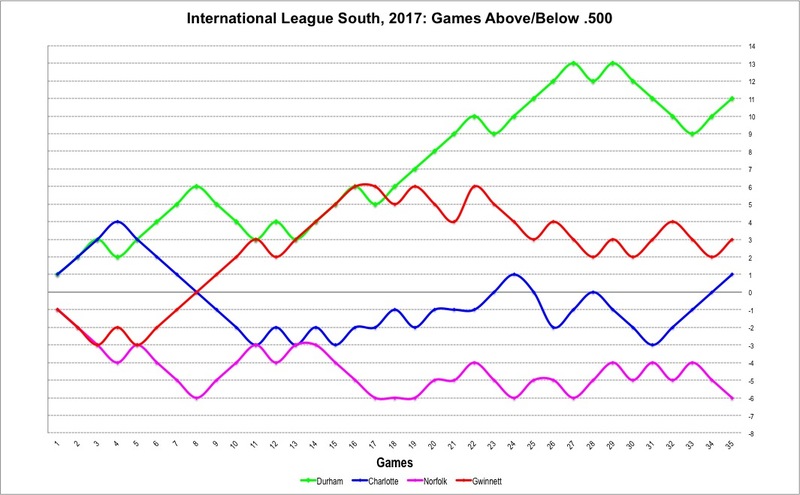 The Bulls are now four games ahead of Gwinnett in the IL South and have the best won-loss record in minor league baseball. 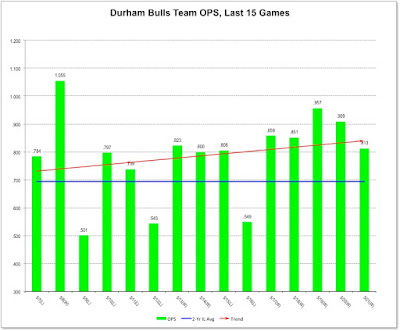 Bulls hitters are doing a great job. Their On-Base plus Slugging Percentage (OPS) is well above the IL average and ranks 3rd in the IL. RHP Yonny Chirinos came up from Montgomery and started last night (and won). 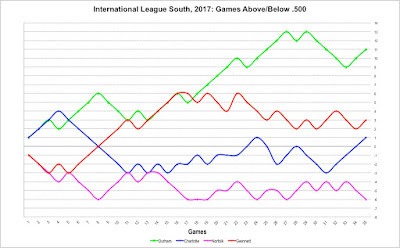 The Norfolk Tides (Baltimore's Triple-A) are not having a good start this year. This will be the first of 11 games against the Tides, so we will get to know them well before the year is out. Everything to like about the 5 and 1 home stand by the Bulls. They stay in first place in the South Division and are at the top or near the top in most statistical categories. 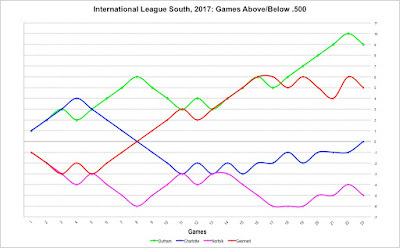 Patrick Leonard was named International League player of the month. Biggest worry is lack of starting pitching. The Bulls had to make do with two bullpen games (but won them both). The Bulls are getting reliever Ryan Garton back from Tampa Bay. No word on who will be leaving the bus . Dr. Miraculous is reporting that Yonny Chirinos (RHSP) is coming to the Bulls. This would be his AAA debut. Gwinnett, at this point in the season, is the Bulls' competition in the South Division. They are coming off a 7-game road trip to Rochester and Pawtucket where they lost 4 and won 3 games.